Finding a scalable PDF solution for users is often the last thing on the mind of a busy IT Pro. 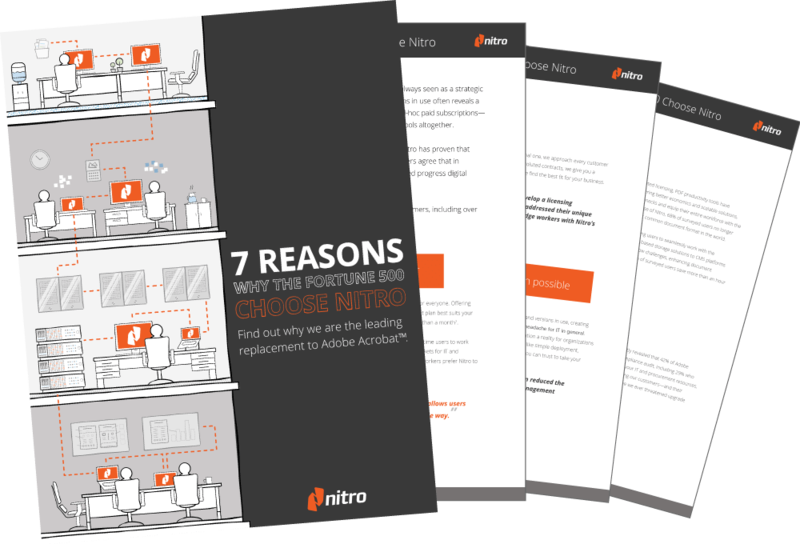 But we argue that replacing your current deployment of Adobe Acrobat with Nitro Pro can have a significant and positive impact on many areas of your business. Discover how in this whitepaper. In this new, free guide, you'll find a true debate of the product value and an in-depth analysis of Adobe Acrobat Standard from an IT manager's perspective. Quotes from IT Pros that successfully switched to Nitro. Info on Nitro's approach to simple, no-sweat compliance. An overview of Nitro's feature set, customer service, and deployment options.